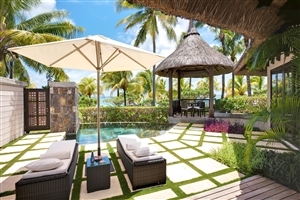 Recently redesigned by the famous interior designer Kelly Hoppen, this resort is tucked away in the sleepy village of Belle Mare and the perfect place to enjoy the splendour of Mauritius. All the rooms are bright and spacious, serving as the ideal base for your stay in paradise while the mix of culinary cuisine is only bettered by the views from the restaurants of the hotel. 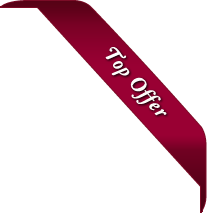 Looking to be pampered? Get some healing and rejuvenation as you relax is the LUX ME spa through yoga and facials. Once you have achieved healthy body and mind, it is time to get a little more active. 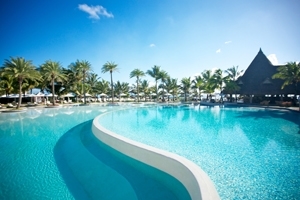 Golf, cycling and hiking are options in the surrounding areas while out on the water you can enjoy diving, fishing, kitesurfing and swimming with dolphins as well as snorkelling around the protected coral reefs. 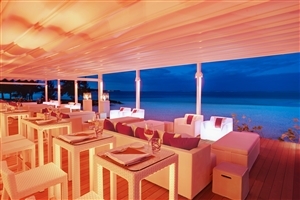 Once the sun sets in paradise, you can eat and head to the bar for a great cocktail as you toast to the day just gone; probably whilst watching the al fresco cinema. Superb service, a stunning setting and a beautiful complex with traditional thatched roofed wooden structures throughout await you at the LUX* Belle Mare as you enjoy one of the best beachfront locations on the warm coastline of Mauritius. 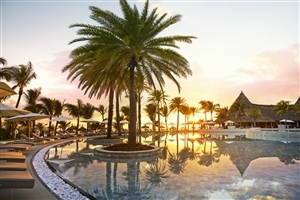 An energetic hotel in a sleepy village, the LUX* Belle Mare is a top luxury hotel tucked away on the east coast of the stunning island of Mauritius. 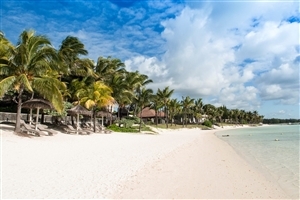 Traditional Mauritian life is splendidly mixed with a vibrant atmosphere as you walk across the unspoilt soft sands of the private beach towards the sparkling waters that lap the shore. 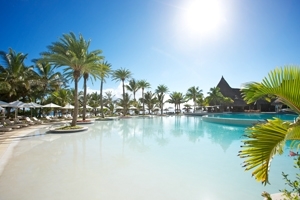 Perfect for a relaxing holiday, the resort has had a makeover by the world-renowned London designer Kelly Hoppen, and this has resulted in a destination that blends an authentic experience with extravagant modern comfort. 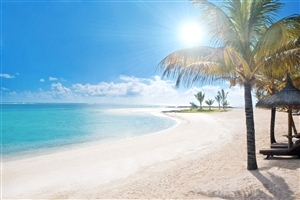 The idyllic tropical paradise is your classic island getaway where the visitors can’t help but dress in all white as they sashay past the swaying coconut palm trees. A fabulous setting for a romantic retreat or family getaway, you are sure to enjoy a wonderful experience with outstanding service. 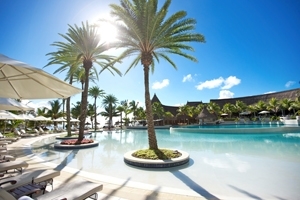 Spend your days soaking in the sun on the sumptuous stretch of beach or taking a dip in the huge swimming pool right at the heart of the LUX* Belle Mare. 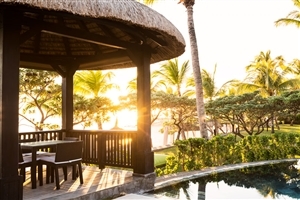 Get out of the sun and enjoy some pampering at the stunning spa, meander your way round 18-holes at the incredible golf course or get out on the Indian Ocean for some water sports. 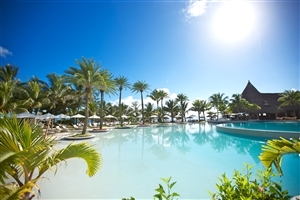 Into the accommodation, the rooms and suites come in a variety of options and they are well appointed to be an airy sanctuary during your break to Mauritian paradise. 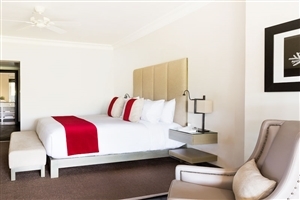 The Junior Suite offers guests 60sqm of accommodation space that provides plenty of comfort and style. 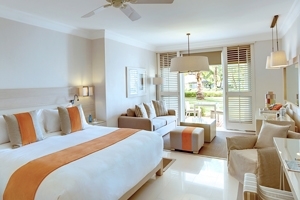 The spacious suite is decorated with neutral tones that contrast against vibrant shots of colour to create a welcoming ambiance, while the stylish furnishings and beautiful garden and lagoon views top the exotic setting off. The Junior Suite Pool View offers guests 60sqm of accommodation space elegantly decorated with warm, wooden furnishings and quality amenities, boasting glorious views of the refreshing swimming pool, the gardens and the lagoon. 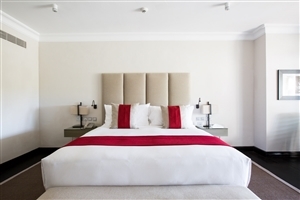 The Romantic Junior Suite offers guests 60sqm of accommodation space that puts emphasis on both comfort and style, punctuating the spacious setting with neutral toned decor by adding shots of vibrant colour to create a beautiful haven. The tranquil suite is ideal for couples and comes with an additional terrace that overlooks the tropical gardens and zen pond. The Junior Suite Beach View offers guests 60sqm of accommodation space that blends dashes of vibrant colour with comfortable, wooden furnishings to create a setting of style and comfort. A lavish marble bathroom and a spacious living area accompany a private terrace with views overlooking the gardens and lagoon for added luxury. 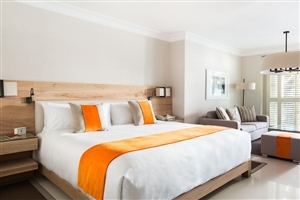 The Ocean Suite offers guests 90sqm of accommodation space fully equipped with a variety of quality amenities contained within a hub of elegant decor. The luxuriously spacious suite encourages utter relaxation with its incredible views of the Indian Ocean as seen from the private terrace. The Honeymoon Suite offers guests 95sqm of accommodation space set to polished wooden floors and lavish furnishings to create the perfect intimate setting where couples can enjoy the gentle breeze and amazing views from the spacious private terrace. The LUX* Suite offers guests 240sqm of accommodation space that sports intricate designs stylish decor, combining modern day comforts with sublime elegance and culture. Guests can enjoy the spacious dining area before retreating for a private relaxation session on the rooftop terrace, complete with solarium and whirlpool. 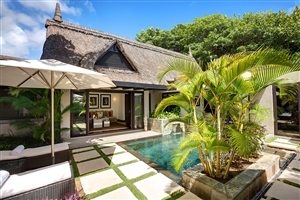 The suite contains an additional terrace with views of the tropical gardens and zen pond, while private butler service is just the thing for complete luxury. 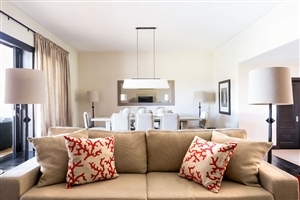 The Family Junior Suite offers guests 120sqm of accommodation space consisting of interconnected suites ideal for families and large groups of travellers. 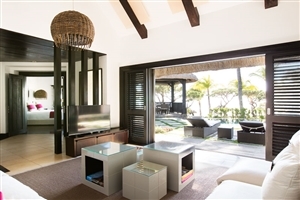 The suite is generously spacious to allow plenty of room to roam, and comes fully fitted with comfortable, natural furnishings set against bursts of vibrant coloured decor to accompany the luxury bathroom and private terrace showcasing the sparkling lagoon and gardens. 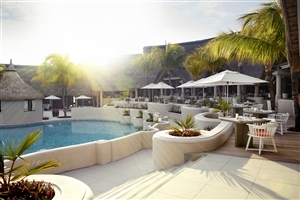 Mixe – Taste the tantalising wonders of authentic island cuisine at the resort’s main restaurant with buffet breakfast and dinner. 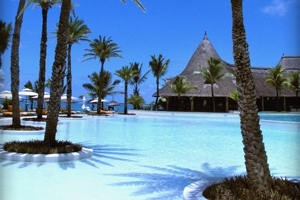 Beach Rouge – Enjoy an eclectic a la carte menu of Mediterranean favourites accompanied by a refreshing mix of cocktails at the relaxing restaurant and lounge. 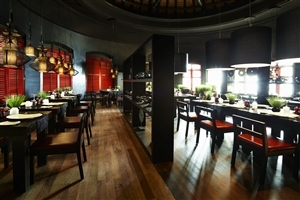 Duck Laundry – Asian flavours and aromas create a mouth watering setting for an authentic dining experience with Tapas dishes and cocktails to follow. 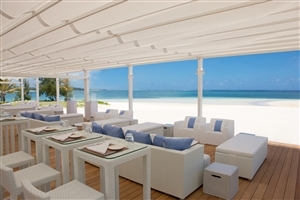 Amari – Embrace the fresh herbs and spices of traditional Indian gourmet dishes infused with international ingredients in a setting that overlooks the Indian Ocean. 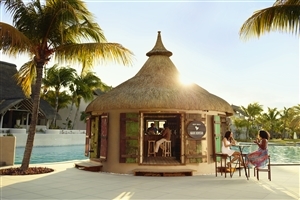 Mari Kontan - Sit back and relax at this cabana-style Mauritian rum corner. 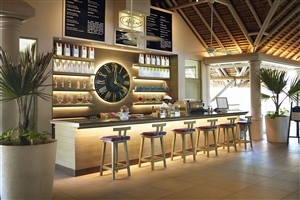 K Bar – Ease into this relaxing setting with some craft beers. Cafe LUX* – Delicious Island blended tea made from organic green beans is the perfect way to bask in bliss at the stylish cafe. Tea House - Choose from an international selection of teas at this flavoursome tea house. 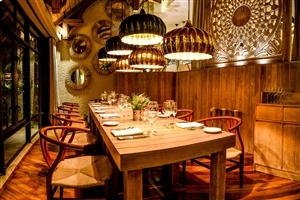 Amari by Vineet - Dine fine at this exclusive restaurant where modern flavours and incredible cuisines are created by award-winning Michelin-starred chef Vineet Bhatia. Water sports – kitesurfing, fishing, diving.